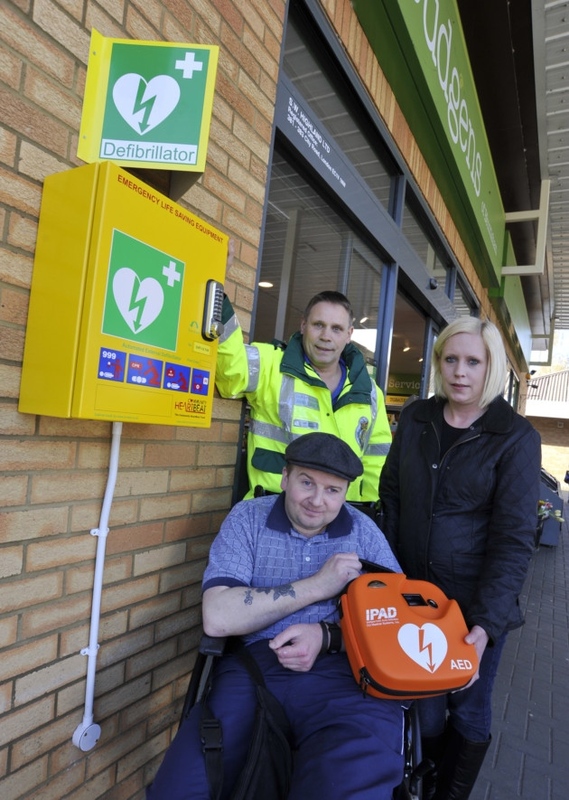 After a series of successful fundraising events by the staff of Budgens of Holt, a Community Public Access Defibrillator has been purchased and installed on the exterior of the wall. The initiative to provide defibrillators in the local area for general public use was launched two years ago by Holt and Communities First Response (H&CFR), following a change in the guideline of their use by the resuscitation council. With the help of Andrew Barlow, Resuscitation Officer for the East of England Ambulance Ambulance Service and the national charity, the Community Heartbeat Trust, this latest defibrillator at Budgens, with a newly designed exterior cabinet, is the first one for Holt and brings the total number of defibrillators to have been installed to four locally. Sandra Taylor-Meads, Manageress of Budgens said she was delighted at how quickly the money had been raised to purchase the defibrillator and she would like to thank all of the staff for their efforts and the customers for their genrous donations. David Hunt, P&P/Campaigns officer said "Already this embryonic scheme has proved beneficial. Earlier this year, the very first defibrillator that was installed in the area, at Kelling Heath Holiday Park was used successfully on a collapsed member of the public. Our efforts with this initiative have encouraged general awareness of basic life support skills in our area and we frequently hold free training courses for the general public. To our delight, we have also found that a number of companies, institutions and village communities in the area are now fundraising in order to install their own defibrillators. As we have always said "You don't have to be a fireman to use a fire extinguisher, you don't have to be a paramedic to use a defibrillator."